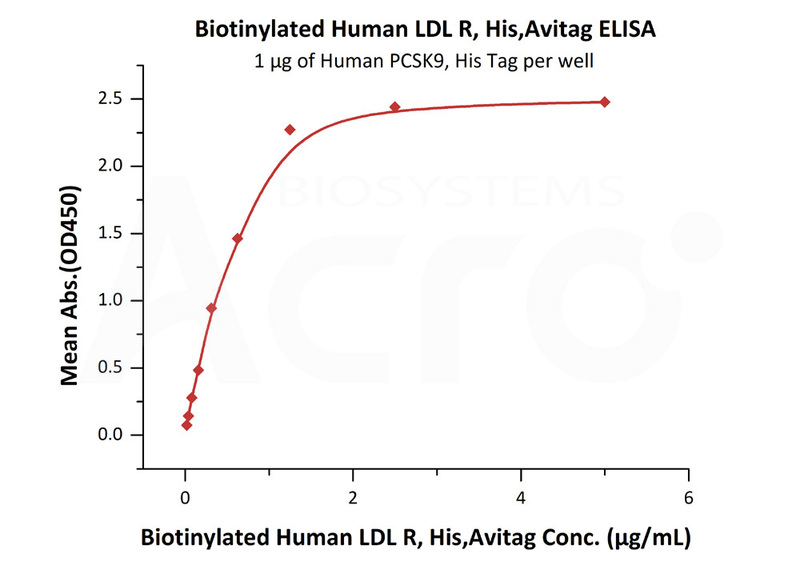 Biotinylated Human LDL R, His Tag, Avi Tag (LDR-H82E7) is expressed from human 293 cells (HEK293). It contains AA Ala 22 - Arg 788 (Accession # P01130-1). The protein has a calculated MW of 88.5 kDa. The protein migrates as 90-150 KDa under reducing (R) condition (SDS-PAGE) due to glycosylation. >80% as determined by SDS-PAGE. Biotinylated Human LDL R, His Tag, Avi Tag on SDS-PAGE under reducing (R) condition. The gel was stained overnight with Coomassie Blue. The purity of the protein is greater than 80%. Immobilized Human PCSK9, His Tag (Cat. No. 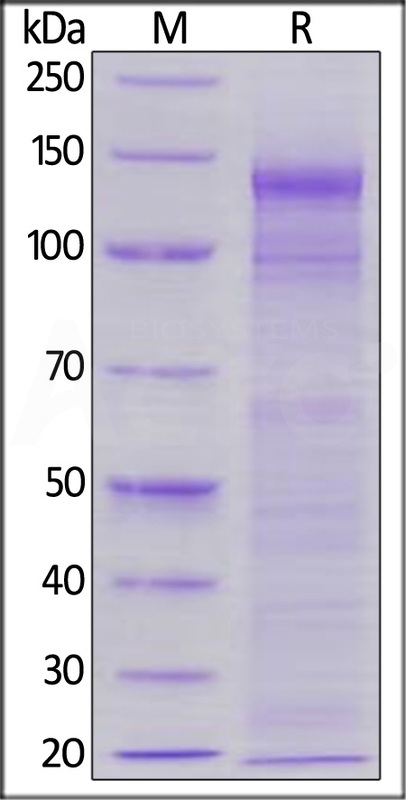 PC9-H5223) at 10 μg/mL (100 μL/well) can bind Biotinylated Human LDL R, His Tag, Avi Tag (Cat. No. LDR-H82E7) with a linear range of 0.02-0.625 μg/mL (QC tested). Low-Density Lipoprotein (LDL) Receptor is also known as LDLR, FH, FHC, LDLCQ2, and is a mosaic protein of ~840 amino acids (after removal of signal peptide) that mediates the endocytosis of cholesterol-rich LDL. It is a cell-surface receptor that recognizes the apoprotein B100 which is embedded in the phospholipid outer layer of LDL particles. The receptor also recognizes the apoE protein found in chylomicron remnants and VLDL remnants (IDL). It belongs to the Low density lipoprotein receptor gene family. LDL receptor complexes are present in clathrin-coated pits (or buds) on the cell surface, which when bound to LDL-cholesterol via adaptin, are pinched off to form clathrin-coated vesicles inside the cell. This allows LDL-cholesterol to be bound and internalized in a process known as endocytosis and prevents the LDL just diffusing around the membrane surface. This occurs in all nucleated cells (not erythrocytes), but mainly in the liver which removes ~70% of LDL from the circulation. Synthesis of receptors in the cell is regulated by the level of free intracellular cholesterol; if it is in excess for the needs of the cell then the transcription of the receptor gene will be inhibited. LDL receptors are translated by ribosomes on the endoplasmic reticulum and are modified by the Golgi apparatus before travelling in vesicles to the cell surface. LDL is directly involved in the development of atherosclerosis, due to accumulation of LDL-cholesterol in the blood. Atherosclerosis is the process responsible for the majority of cardiovascular diseases. (1) Yamamoto T, et al., 1984, Cell 39 (1): 27–38. (2) Nykjaer A, Willnow TE, 2002, Trends Cell Biol. 12 (6): 273–80. (3) Barrett P.H., Watts G.F. 2002, Atherosclerosis. Supplements. 2: 1-4. (4) Nomura S. et al., 2004, Gene. Therapy. 11: 1540-1548.